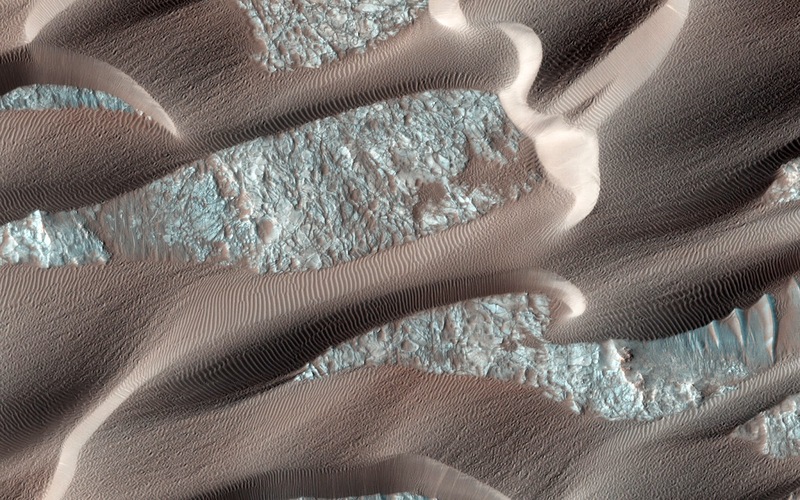 Nili Patera is a region on Mars in which dunes and ripples are moving rapidly. HiRISE continues to monitor this area every couple of months to see changes over seasonal and annual time scales. Here we see obvious activity over a span of less than two Earth years. Three prominent changes are obvious: 1) the dunes are migrating, with position differences of a few meters in some areas; 2) the ripples on the surfaces of the dunes have undergone so much change that they cannot be reliably tracked over this time interval; and 3) the lee faces of the dunes exhibit new avalanches. These results show that Nili Patera, and other regions on Mars, are areas of active sand migration and landscape erosion. Note: For more information, see PIA18818: Continual Dune and Ripple Migration in Nili Patera.